Below is a neat little overview of the work of Mike Baillie and others to define a cause for the worldwide climate downturns of: 3195 BC, 2354 BC, 1628 BC, 1159 BC, 207 BC, 44 BC, and 540 AD. It is found here on a website devoted to liberalizing Islam (not a bad cause itself). Unless a modern day Twain, Mark penned this, I think we can assume the author was using a nom de plume. He does provide his email at the bottom, however. It’s not until recently that some scholars have begun to think something very unusual happened around that time, that perhaps the apocalyptic writings of sixth century historians are pointing to something more concrete than political and economic hardship. Their most important clue came not from musty old libraries, but from the forests. Trees live a very long time, their memories are accurate, and they hold a grudge forever. Deprive them of good sunlight for a season and they’ll complain about it hundreds of years later. And the trees, it turns out, have much to complain about. Trees respond to anomalous growth conditions in different ways, depending on their region and their species. A cold year, or one that’s poor in rainfall, might yield a noticeably narrow ring, or even a microscopic one. A year with a hard, early frost after a relatively normal summer would have rings of normal size, but with damage at the cellular level. Some trees, which thrive in cold conditions, might have an unusually wide, robust growth ring in a year thought to be a nearly total loss by other species of trees. And in a spectacularly bad year, many trees will skip a ring altogether, and not have a growth ring at all, even at the microscopic level. Although of interest originally to astronomers, dendrochronology became popular with archeologists. Other trees began giving up their secrets, always reaching further into the past. The giant sequoia of California, which can live two thousand years, yielded information on prehistoric droughts and fires. And in the 1950s, Edmund Schulman began to study the world’s longest-lived tree, the bristlecone pine. Found in the Nevada mountains, the bristlecone pine is a stunted specimen looking more like a piece of standing driftwood than a living organism, but it can live five thousand years! The sum data from living and dead bristlecone pines provides scientists with an eight-thousand-year-long record of regional weather conditions. European scientists had no such longlived trees to work with. Instead, Germany’s Bruno Huber in 1930 embarked on a grueling 30-year mission to construct an oak chronology. Oaks live only a few hundred years, but Huber had access to a rich supply of historical buildings made with oak timbers. Once again, by overlapping the dead timbers with living trees, and then laying over these even older timbers, a one-thousand-year record was constructed. Dendrochronologists chart the ring sizes, then compare the charts, correlating distinctive patterns. Andrew Douglass was so adept that he could date a piece of wood without referencing his charts, by eyeballing the signature sequences. But a chronology constructed with thousands of trees, such as Huber’s oak chronology, can overwhelm even the most knowledgeable scientist. In the 1960s, computers accelerated the process, stretching the German oak chronologies back to nine thousand years ago by running correlation programs on data from thousands of trees, and checking the similarity of patterns at every possible point of overlap. Using Huber’s manual methods, it would have taken another two hundred forty years to complete this chronology. As a source of environmental information, tree ring chronologies have also correlated highly with other records. For example, the European oak master chronology contains a dramatic growth reduction event in AD 1740-1741. This coincides with a temperature reduction recorded in Manley’s Central England temperature record, which extends all the way back to AD 1659. A hard freeze set in in 1739, precipitating a famine and the death of three hundred thousand people in Ireland. Observers in England and Ireland recorded unprecedented cold that winter, with water freezing in mid-air as it was poured into a glass, and Ireland’s Lough Neagh frozen across its twenty mile surface. The Irish bog oak chronology independently identified 1739 as an extraordinarily cold year. Occasionally environmental conditions are so stupendously bad that it’s noticed by trees all over the world. As these very long, and very broad master chronologies evolved, certain dates in history began to stand out as being distinctly unusual. 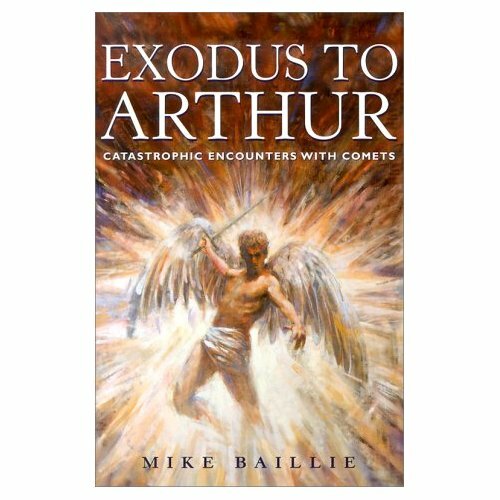 As described in Exodus to Arthur: Catastrophic Encounters with Comets, by Mike Baillie, those dates are: 3195 BC, 2354 BC, 1628 BC, 1159 BC, 207 BC, 44 BC, and 540 AD. The question remains, then, why is it so little known in our own time? A partial answer lies in looking at these historical writings from a regional perspective, since history is generally studied one nation, empire, or continent at a time, rather than in cross section across the entire planet. Additionally, without a scientific explanation for the phenomenon, the imagination fails. What could cause eighteen months of darkness? It’s much easier to believe that Cassiodorus Senator, Procopius, John of Ephesus, and the others were indulging in hyperbole, and possibly even speaking metaphorically, than to face the challenge of solving such a mystery, and possibly exposing oneself to ridicule. It’s far easier to cook up and/or except a supernatural story. Lastly, our society has a certain myopia regarding climate changes. Human beings are not good at understanding worldwide weather patterns on a geologic time scale, and tend to assume that the weather we experience during our lifetimes is the weather that is completely normal for the planet at all times. And when climate change does occur, we are only too happy to take the credit for it (or the blame). It is uncomfortable and uncharacteristic for human beings to accept that something beyond our control could take away the seasons, the rain, and the Sun. Thus, even in the face of incontrovertible evidence that something happened in AD 536, and the fact that we have had this information in our libraries for the past millennium and a half, we still don’t know about it. We deny it. Having established that an event definitely did occur in AD 536, it remains to determine what type of event it was. The first theory, proposed by Val LaMarche and Tom Harlan, based on the testimony of California bristlecone pines, was that the periodic temperature minimums recorded by tree rings were caused by volcanic eruptions. A sufficiently large volcanic eruption could theoretically inject debris into the stratosphere, spreading it across the globe. The resulting “veil,” composed of dust, droplets of sulfuric acid, and ice crystals, could have caused the effects noted by Senator, Procopius, and John of Ephesus. The magnitude of the eruption would have to be stupendous, much greater than Krakatoa or Pinatubo or any other eruption recorded in modern times. The presence of frost rings in the bristlecone pines, indicating a normal growing season interrupted by a sudden hard frost, supports this hypothesis. Candidates for ancient volcanoes sufficient to shut down sunlight worldwide are scarce. One such was Santorini, a volcano that blew apart a sizable island in the Aegean. Ice cores showed a significant acid layer at 1390 +/- 50 BC that was tantalizingly close to the accepted date of c. 1500 BC for the Santorini eruption given by Egyptologists. Unfortunately, dendrochronologists had pinned 1628 BC exactly as the target date for the Santorini eruption. This debate raged for several years until 1987, when new data showing an acid layer at 1645 +/- 20 BC was published. However, this new information led not to consensus, but more debate, as the ice core camp refused to acknowledge that their date was the same as the dendrochronologists’ 1628 BC date and the Egyptologists refused to consider variations from their accepted historical chronologies. An asteroid is a rock in space. They occasionally enter Earth’s atmosphere, leaving a fiery trail behind them, and become “shooting stars.” Comets contain ice, and thus are sometimes called “dirty snowballs.” They are thought to originate from outside the solar system, and when they approach the warmth of the Sun, the ice melts and forms an atmosphere, which gives rise to the comet’s tail. Asteroids are much more common than comets. Small extraterrestrial impacts occur frequently. NASA classifies Near-Earth Objects (NEOs) as “small bodies in the solar system (asteroids and short-period comets) with orbits that regularly bring them close to the Earth and which, therefore, are capable someday of striking our planet.” Millions exist between 0.1 km and 1 km in diameter. There are five hundred million between 10 and 100 m. Each year there is on average one impact with an object up to 6 m in size, giving rise to a 15-kiloton explosion. The estimated minimum global catastrophe threshold is 1 km in diameter. One thousand 1-km NEOs exist. This new information demands a new perspective on history. If we accept that the Earth has been bombarded many times in the history of civilization, resulting in a worldwide “nuclear” winter, plague, famine, loss of population, and the collapse of civilizations, two new questions surface. First, except in the case of 536 AD, none of these events are directly recorded. What sorts of indirect accounts and oral histories survive to tell us of these great apocalypses? And second, how does a global catastrophe shape history? Answering the first question requires a reexamination of the 1628 BC “Santorini eruption” event. 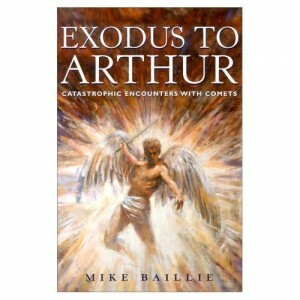 In Exodus to Arthur, Baillie postulates a link to the biblical Exodus. Many biblical passages lend themselves to a catastrophic interpretation. The Israelites followed a “pillar of cloud by day and fire by night,” which could have literally been Santorini as seen from Egypt. However, other biblical phenomena don’t fit as neatly with the volcano theory. Could it instead have been a cometary impact, or a close pass of a comet, resulting in earthquakes, volcanic eruptions, and tsunami as secondary effects? Again, in light of the date discrepancies (biblical scholars place the Exodus in the thirteenth century BC) it seems outrageous to suggest that the whole thing happened four centuries earlier and that it was really caused by a comet. But if one accepts that something extraordinary happened in 1628 BC, something noticed by trees all over the world, then it’s not such a stretch to think it might have been recorded in the story of the Exodus. From the point of view of the Hebrews of the seventeenth century BC, it must have seemed like the world was actually ending. They had to have remembered it somehow. In addition to the Exodus story, Baillie has forged a tenuous link between the 2354 BC event and the biblical Flood. Based on observations of the atmospheric explosion of a relatively small (about 40 m across) object above Tunguska in Siberia in 1908, Baillie speculates that a much larger impact could have caused worldwide inundations and/or tsunami. A detail too tantalizing not to mention is that Bishop Usher (best known for calculating the age of the Earth based on the Bible) dated the biblical Flood to 2349 BC. Usher’s chronologies are now disfavored, and there may never be a way to definitively link the Flood story with a comet event, but it’s fascinating all the same. Another well-known mythology that bears a catastrophic interpretation is the story of King Arthur. Although scholars place the historical King Arthur in the fifth century, the date of his death is given as AD 539. Furthermore, much of the imagery from the Arthurian legend fits with the appearance of a comet and subsequent famine and plague–the “Waste Land” of so much legend. Ireland’s St. Patrick stories feature a wasteland as well. And although St. Patrick is credited with chasing the snakes out of Ireland, it’s worthwhile to consider that there never were snakes in Ireland, and that snakes and dragons are common images associated with comets. Until the sixth century, the Britons had held control of post-Roman Britain, keeping the Anglo-Saxons isolated and suppressed. In the wake left by the Roman empire, the Britons maintained the status quo, living in towns, with elected officials, and carrying on trade with the empire. After AD 536, the Britons all but disappeared, and were replaced by Anglo-Saxons. It’s a matter of debate whether the Anglo-Saxons killed all of the Britons, or assimilated them. But a competing theory is that the bubonic plague that afflicted the Roman empire wiped them out, and that the Anglo-Saxons enjoyed relative immunity due to their barbaric lack of trade or other contact with the civilized world. And in Yemen, in the 540s, a dam broke. By 550 AD, the great Marib Dam, an engineering marvel of the ancient world, was a complete loss and thousands of people migrated to another oasis on the Arabian peninsula, Medina. The Arab tribes, weakened by famine, begin to rouse themselves and think of conquest. In 610 AD, a new leader unified them–Muhammad. Although all of the interesting historical changes happened in the seventh century–the Roman war with Persia, the rise of Islam, rebellion and civil war in the Roman empire, and the advance of the Slavs driven by the Avars–all can be legitimately traced to the environmental catastrophe of 536 AD. These effects in history’s most recent, best documented global catastrophe have implications for all of human history. There is a theory in evolutionary biology called punctuated equilibrium which explains how a species could exist quite stably in the fossil record, and then suddenly be replaced by another. First proposed by Niles Eldredge and Steven Jay Gould, the controversial theory has come to gain wide acceptance. Evolution, it states, is not a slow, gradual, continuous process, but an uneven one. Long periods of little or no change are punctuated by periods of rapid, dramatic change. The fast changes are most likely triggered by extinction events, with new species expanding to fill the vacuum. The most famous example of this process is the extinction of the dinosaurs (caused by an asteroid) and the subsequent rise of mammals. Advocates of the comet theory have a similar message, though less specific. There is no way to predict when the next object will strike the Earth. NASA and the US Air Force have initiated programs to search for and track near-earth objects. NASA’s Spaceguard program aims to find 90% of NEOs larger than 1 km (global catastrophe threshold) within the decade. None of the currently identified NEOs poses an impact risk to the Earth. However, it is estimated that less than half of the larger ones are identified, so a major impact could occur any time without warning. An even greater concern is a much larger extraterrestrial impact, of the class that destroyed the dinosaurs. It is unlikely that humanity could survive contact with some of the larger NEOs, and even unlikely that we would defend ourselves even if we had advance notice of such a catastrophe. Colonization of other planets is one option for keeping the species alive, but the one we’ll most likely choose, it seems, is no different than in ancient times, when people responded to disaster by aspiring to more “righteous” behavior to avoid angering the deities, which is to say that at this time there is no practical, scientific solution to this problem.